From the creator of Nuclear Throne Together. 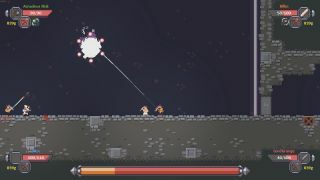 You may remember Vadim from Nuclear Throne Together, which added an online mode to Vlambeer's twin-stick shooter, as well as similar mods for Spelunky, Wasteland Kings, and other games. Now he's done the same for Caveblazers, adding online co-op to the 2D roguelike platformer. And it's available on Steam. Vadim has written a blog post about the process of creating the Caveblazers Together mod if you're interested in a look behind the scenes. He writes about trickiness of creating it while the game was still being updated, but notes that if the game weren't still receiving patches it likely wouldn't have enough of a community to make it worthwhile creating this kind of mod for it. Vadim says that he'll keep the mod updated, and may add achievements in the future—since it's a separate executable, you can't unlock regular achievements while playing the modded version. It's also worth reading the full blog for the chat commands that make options like 360 mouse-aiming and a quickstart mode available.